The Outdoor Jazz schedule is relatively strong for the last weekend of September, so hang onto fresh air music season while it lasts! The Whatyouwill Festival returns to Old World Stone Carving in Sunbury for its 7th annual installment all weekend – read our preview here. On Friday, September 28th, the 8th Annual Cookies, Popcorn and Jazz event will be held at Barnett Community Recreation Center (East Side), starting at 12:30pm with presentations and children’s music workshops before Urban Jazz Coalition performs at 2pm – more details here. On Saturday, September 29th at 9:30am, Anna Paolucci’s Strings n Tings plays one more family-friendly show of sassy torch blues at Clintonville Farmers’ Market for the year. Later at 1pm, jazzy funk explorers Flogo Shaggins (formerly The Broadstreet Lineup) will perform as part of the fun music schedule at Chalk The Block 2018 at Easton Town Center – more details here. On Sunday, September 30th at 1pm, the 2018 Harrison West Jazz Stage season continues with the toe-tappin’ New Orleans groove of the 20+ years’ strong New Basics Brass Band at Harrison Park Gazebo before a rain-postponed season finale next week (stay tuned for details) – season details here. Keep reading for fun weekend suggestions including George DeLancey paying tribute to Oscar Pettiford with Dave Powers! Friday, September 28th (8 – 10pm): Ohio State Big Bands at Weigel Hall. School is back in session, and OSU’s big bands are wasting no time getting back in the swing of things! The Ohio State University Jazz Ensemble led by Kris Keith and the Jazz Lab Ensemble directed by Mike Smith will present a joint concert to kickoff the academic year. “Selections performed will reflect many facets of American big-band repertoire over its nearly 100-year history.” The concert is free and open to the public, so come on down to campus to hear classic jazz performed by the stars of tomorrow! And if you can’t make it to Weigel, the event will be live-streamed here. Saturday, September 29th (7 – 9:30pm): Jazz at the Pelican Room: Right at Zero at The Pelican Room, Downtown. This popular nightspot continues to find ways to incorporate jazz into its entertainment programming. Right at Zero, violinist Stephen Spottswood’s project with James “Smooth” Elliott on drums and Dominic Baer on keys, starts a series of monthly shows on the last Saturday of the month through fall. The band blends jazz, soul and classical with excellent musicianship, and has been working on a debut EP – stay tuned for details. Tickets are available here for this fun night out in the city. Sunday, September 30th (5:30 – 8pm): A Tribute to Oscar Pettiford with George DeLancey and the Dave Powers Trio at Clintonville Woman’s Club. The CWC has another swinging weekend ahead with the return of pianist Powers’ House Jazz Concert Series and its “The Art Of The Trio” concerts highlighting acclaimed bassists in a trio setting with Powers and drummer Louis Tsamous. 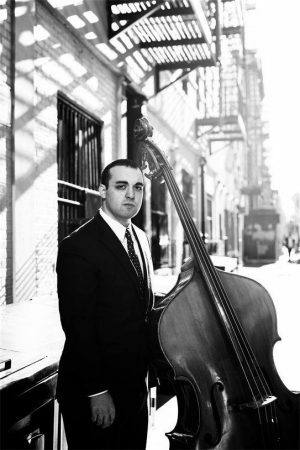 Bassist, Cambridge native and Columbus Youth Jazz Orchestra alum DeLancey maintains a busy schedule performing and recording in New York City as well as touring around the world. Sunday’s concert will pay tribute to Oscar Pettiford, the legendary bassist who rose to fame in the bebop era and became known as “one of the most-recorded bass-playing bandleader/composers in jazz.” Admission is $15 at the door for adults and $10 for students, and doors open at 5:00 PM. More details here for a top-flight way to wrap up your weekend!